"We have the promise from heaven that peace would come to the world by this explicit means: the solemn and public Consecration of Russia (by the Pope) in union with the Catholic bishops of the world." Our Lady of Fatima warned: " Russia will spread its errors throughout the world, raising up wars and persecutions of Church...The good will be martyred, the Holy Father will have much to suffer and various nations will be annihilated." The Vatican said it will step up its political engagement due to the dangerous state of the world, but a Roman Catholic priest, dedicated to Our Lady of Fatima, said the Pope does not need to confer with world leaders to bring peace, rather it requires only one specific, solemn act on his part: The Consecration of Russia to the Immaculate Heart of Mary, the Mother of Jesus. Fr. Nicholas Gruner, a Canadian priest dedicated to the spreading the message of Our Lady of Fatima explains: "We have the promise from heaven that peace would come to the world by this explicit means: the solemn and public Consecration of Russia (by the Pope) in union with the Catholic bishops of the world." According to Fr. Gruner, the special act of Consecration requires only a five minute prayer. 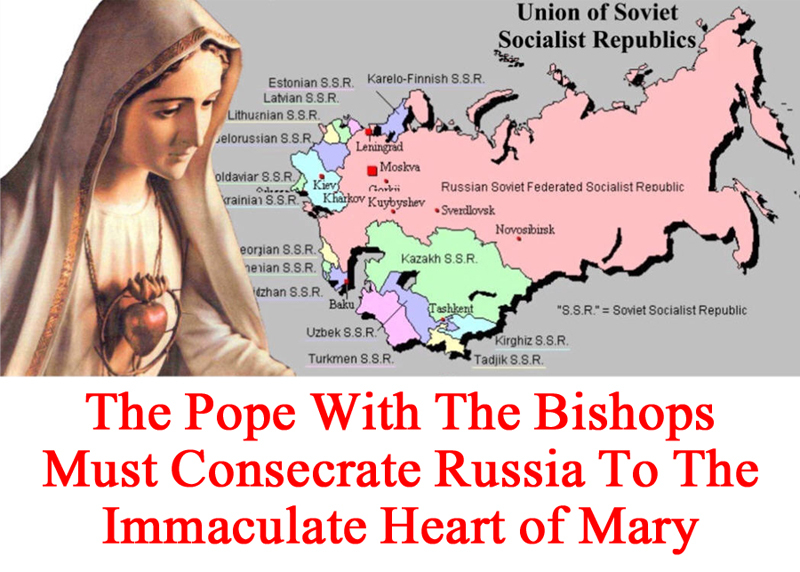 Knowledgeable Catholics, including recent Popes, believe that this command for the Consecration of Russia comes directly from the Virgin Mary who appeared to three shepherd children in Fatima Portugal in 1917. Francisco and Jacinta, two of the three seers of Fatima died in 1919 and 1920. Lucia dos Santos, the surviving seer, (who later became Sister Lucia), said the Virgin Mary promised: "If my requests are heeded, Russia will be converted and there will be peace." On the other hand, if the Consecration is not performed, Our Lady of Fatima warned: " Russia will spread its errors throughout the world, raising up wars and persecutions of Church...The good will be martyred, the Holy Father will have much to suffer and various nations will be annihilated." The Fatima apparitions have been approved by the Catholic Church since 1930. Our Lady of Fatima gave tangible proof of her appearance with the Miracle of the Sun, witnessed by 70,000 on October 13, 1917. The Miracle of the Sun was recorded in history by the mainstream media in 1917. "I …saw it [the sun] as a disc with a clean cut rim, luminous and shining, but which did not hurt the eyes. I do not agree with the comparison which I have heard made in Fatima — that of a dull silver disc. It was a clearer, richer, brighter color, having something of the luster of a pearl … I felt it to be a living body … It looked like a glazed wheel made of mother of pearl … It was a remarkable fact that one could fix one's eyes on this brazier of light and heat without any pain in the eyes or blinding of the retina." "The sun trembled, the sun made sudden incredible movements outside all cosmic laws — the sun 'danced' according to the typical expression of the people. It shook and trembled; it seemed like a wheel of fire." So significant are these apparitions to the Holy Catholic Church and the world, Pope Francis dedicated his papacy to Our Lady of Fatima. In 2010, Pope Benedict XVI said this: "He deceives himself who thinks the prophetic mission of Fatima is concluded." While the Popes have affirmed the importance of Fatima, sadly the Consecration of Russia has not been fulfilled. "If it had, we would have peace," said Fr. Gruner. "Sr. Lucia insisted that Russia, and only Russia, was to be the object of this public act of obedience and prayer." While several popes have undertaken consecrations of the world since the request was made public (including Pope John Paul II in 1982 and 1984), none of these have fulfilled the specific requirements of Our Lord and Our Lady's requests. And today, the Consecration of Russia has been one of the most controversial aspects of the visitation from Our Lady of Fatima. Our Lady promised peace to the world, and given the daily headlines regarding Ukraine and Russia, it is evident that the Consecration of Russia has not been done. FR. GRUNER SAID IT IS UP TO THE CATHOLIC FAITHFUL TO PRAY THE ROSARY EVERYDAY, AND TO BEG THE HOLY FATHER AND THE BISHOPS OF THE WORLD TO CONSECRATE RUSSIA BEFORE IT'S TOO LATE. "THE WORLD IS NOW... RIGHT NOW, IN GRAVE DANGER OF BEING DRAWN INTO ANOTHER MAJOR WAR," SAID FR. GRUNER. "WE STILL HAVE TIME, EVEN AT THIS LATE HOUR, TO PREVENT THE DIRE PROPHECY THAT: "VARIOUS NATIONS WILL BE ANNIHILATED."